If you’re a writer – or if you want to be a writer – then you’re not normal. Most people don’t want to write. They might day-dream about being a best-selling novelist – just like they day-dream about winning the lottery – but they don’t see any particular attraction in putting words down on paper. Many people actively hate writing. They find it hard, tedious and frustrating. If they have to communicate something, they’d much prefer to speak. Since you’re reading this, I’m guessing you do want to write. You might feel like you hate writing at times – but really, you don’t think you could live without it. That’s not normal. But it’s perfectly okay. In fact, it’s a good thing: the world needs writers, after all. Plus, you’re not alone. There are plenty of other writers out there – and, while you’re unique, you’ll find you have a lot in common with many of them. This isn’t a rule – and if you’re an extrovert, you can certainly still be a writer – but the majority of writers are fairly introverted. People who spend excessive amounts of time alone tend to suffer from anxiety, stress, and even memory loss. Although writing is more or less a solitary act, isolation can cause many problems that hinder your ability to perform. – but I’m not sure I entirely agree. Sure, spending all day, every day alone wouldn’t be good for anyone – but introverts do need a certain amount of alone-time, and that’s no bad thing. There aren’t many full-time jobs for writers. You might end up in a staff role on a newspaper or magazine, but most of the writers I talk to don’t have that kind of career in mind. Writers tend to want to work for themselves, either writing fiction (novels, short stories, etc) or non-fiction (books, blogs, etc). They might well freelance – like I do – producing work on commission for editors. They don’t want to have a “normal” 9 – 5 job. Your family and friends might think you’re crazy if you talk about giving up a well-paid or prestigious job in order to write. You’re not crazy, though. Sure, you might not be normal (but “normal”, in many cases, equates to “unhappy”). When I asked on Twitter “Writers: do you consider yourself “normal”? If not, why not? (And would you want to be? )” I had some great responses. How do you feel about being normal – or not? Like me (and some of my Twitter followers), you might question whether “normal” really exists. You could aspire to be average, but frankly, who wants that? I’m not suggesting that you should be different just for the sake of it. If outrageous clothes and a bizarre lifestyle are your thing, then go for it. But if you’re a quiet, moderate sort of person, that’s perfectly legitimate too. Is that really what you want for your life? As a writer, your quirks are your strengths. Whether you’re writing fiction or non-fiction, your readers will want to hear your voice. And perhaps finding your voice means being willing to take some risks: to embrace your interests and passions – however strange they might be – and to pour your uniqueness into your writing. You’re a writer. You don’t need to be “normal”. The thought of being “normal” is a frightening concept for me, I’ve always been different and unusual in a sort of intangible way, and I like it like that. But isn’t it strange that even those of us who know we are different, try to squeeze ourselves into normal lives, and struggle the horrible discomfort? We often equate being normal with being sensible, or at least this is a strong message we are often taught. But what’s sensible about being someone other than who you really are? All great thoughts and inspiring insights for this cold Monday evening in Perth, Australia, where certainly being an extrovert is deemed far more normal and Australian than being an un-Australian introvert! Yes, I think there’s a strong element of “normal” = “sensible” and especially “normal” = “safe” in society. ah yes. that extrovert thing. Like the Aussies, it’s normal for Filipinos to be extrovert and agree with what the community is doing. This is actually one of the biggest reasons why I prefer to travel on my own – I need the time and space to be alone with my thoughts and just write and enjoy the scenery ( i traveled with a Filipino tour group before and I almost went insane because they’re soooo noisy and nosey). Writing is cathartic for me. I have to write. Getting published is almost secondary. What would anyone want to be normal. The norm is to play life small and never leave your comfort zone. I can’t imagine *not* writing. I like getting my work out into the word — for me, it’s not complete until it has readers — but I’d still write even if I had no chance of ever being able to get anything published! Love this post, and it just the reassurance I needed to hear that though I may hate writing at times (like right now, when I’m procrastinating by cruising Twitter) it is an essential and inextricably wonderful part of who I am. And my soul would wither if I didn’t express myself with words on a regular basis. Thanks! Vanessa’s last blog post ..Tis the Season to Celebrate Rhubarb! Thanks Vanessa, glad this came at a good time! I think that if writing was always easy and fun, it wouldn’t be nearly so powerful, nor so important in our lives. I too loved this post, probably because I have never felt normal, and never wanted to be normal and like all of the people who fall into that profile you describe. Funnily enough, I was talking to my husband about the pressure to be ‘normal’ that is piled on children at school. I said that it was so sad that the school system and social experiences that come with it are all about homogenisation, yet success in adulthood requires one to be different, to be special in some way. Then my husband reminded me that I would think that as a writer, but for most people, life just isn’t like that. I find life pretty scary at times too — but also exciting. I wouldn’t ever go back to the 9-5 and the safe monthly paycheck now… like you say, the writing life is never dull! Homeschooling is wonderful. I homeschool my 11 year old and have done for the last two and a half years. It’s taken me a while to get my head around it, but now I love it. We do a combination of formal schooling – we have tutors who come in and do maths and languages – and I unschool the rest. It’s very fluid and make it up as we go along. And no, homeschoolers are definitely not normal. They’re happy and relaxed and they love learning. After my daughter’s maths lesson last week she was floating around the house using ‘maths’ and ‘joy’ interchangeably. I can’t remember her ever saying that about maths at school. Coincidentally, I’m a writer formerly from Perth, Australia, until I decided to be completely abnormal and throw in a high paying job and go travelling and write books (and eventually ended up in Africa). One of the ‘normal’ things that I grapple with is the fact that I don’t want to write non-fiction, I don’t want to do world changing writing, I write fiction novels set in southern Africa. There seems to be such an emphasis on how your writing can make the world a better place, that “it gives people a few hours of pure escapism” seems somehow cheap. But then, I tried the serious stuff – writing articles, NGO position papers etc, and they all rot my soul. Maybe writers are abnormal because we do what makes us blissfully happy. Should be more of it, I say! I write both fiction and non-fiction but for a very long time, I only ever wanted to do fiction. Now, I’ve found that the non-fiction can be very satisfying and fulfilling too, but in a different way. Yes, I agree, I’ve never considered myself normal. I have contrarian tendencies like going ‘in’ through signs that read ‘exit’, and I question everything! I have weird theories on life, and I am definitely an introvert. Maybe that’s why I feel like writing is my calling. 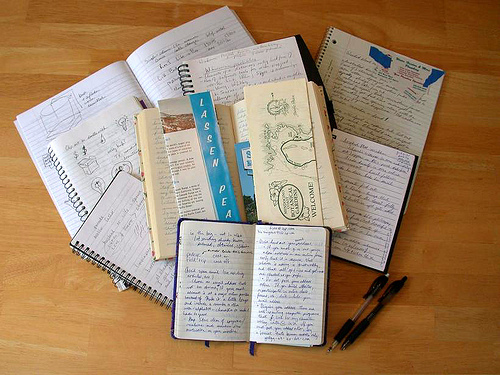 I have a lot of journals piled in a box that look like the pic accompanying this blog post. Zac’s last blog post ..One Of The Best Self-Help Books Ever! As a child, I found myself drawn to sports, creative writing, outdoors, nature, parties, literature, mathematics, etc. I had a variety of hobbies and interests, but I felt ill at ease with formal education and conventional society. I was a dreamy kid: often, the library was my only sanctuary. I felt like an endangered species. Though I was surrounded by friends and family, I always felt this need to escape into a world of books and knowledge. I used to keep a journal–my private thoughts–but my room was invaded, and my precious work fell into the wrong hands. That’s one of the reasons I was often called “eccentric” or a “space cadet” or worse. I was an excellent student, but my favorite class was PT–physical training. I did not like to study, but I loved to learn based on a variety of experiences. I always felt stimulated by my imagination: it would take me away from the ugly facts of daily life. Writing provided an escape from my alienated (though not lonely) boyhood. In fact, I felt I knew too many people and there was way too much socialization, so I used to retreat into a world of books, images and ideas. I wished to escape from too much noise, too many people and other distractions. Creativity was my USP and I loved it. Over the years, I have not become a best-selling author. Nor am I a prolific writer like you. However, when inspiration strikes, I whip out my trusted pen and jot down a few ideas. And that helps me to unwind from a long and hectic day. Yes, artists are introverts. There are exceptions, but artists tend to seek their own, sage counsel. I know of several writers–famous ones–who are introverted. They have escaped to the hills and mountains and plains and rivers to pursue a solitary life. The hurly-burly of normative lifestyles pains these sensitive people. It is part and parcel of the artistic temperament to want to question the status quo, after all, and artists will always march to the beat of their own drummer. They want to listen to the music inside their own hearts. What is normal anyway? And what is abnormal? It is relative. What is normal for one person can be abnormal for another. The theory of cultural relativity also means that values are not absolutes but vary between societies and nations. The only way out of this impasse is to try to be true to yourself. Follow your own bliss. Cheers. I agree … being true to yourself is, ultimately, what matters. “Normal” is incredibly subjective, and often quite a reductive way to think. I get the feeling that your impression of “introverted” is a bit stronger than mine; I’d include writers like J.K. Rowling (who very rarely gives interviews etc) and even a few bloggers who’re well known for speaking at conferences (Chris Garrett, Darren Rowse, etc) but who admit to being quite shy. I’m from the U.S. and I have been writing since I was 10. I’ve written commercial copy for radio (definately not alone on that job) been the editor of a holistic publication – again, lots of people around me as I rewrote others writings. I’ve written a wise woman’s manifesto, a piece that took 8 years (most of it alone) to complete and I am now a conscious living blogger and article marketing writer for suite 101. I love to write and I love to be introspective. I think most creative visionary types enjoy the luxery of alone time. We tend to see ‘alone’ as the main course and ‘socializing’ as the condiments we add as needed. . . to bring out the flavor. I love the way you describe “alone” and “socializing” there! And I agree … my “alone” time is crucial, but I also enjoy being with other people — just not for the majority of my time. The question of “what is normal?” came up in a psychology class I took years ago. My response was that the person across from me was not normal. After 30 minutes of argument the instructor asked me to explain (mainly because I had sat quietly and let them argue their normality with each other). All of us are “normal” to ourselves. “Uniquely normal” is the only true norm. I think writers are a rare breed that are able to embrace that unique normality and turn it into a benefit. Be thrilled that society sees you as “abnormal” (not bizarre because that is another story), and realize that they may simply be jealous of the freedom you have to think and live your life in a way that is outside of the box society always wants to put everyone neatly in. By the way, to answer the extrovert question, that is very true in the United States. Introverts are seen as a bad thing but personally I think that is just PR by the extroverts who would like us all to simply submit and act as their unpaid servants. I think you’re right that people are sometimes jealous — I get the impression that a lot of folks would secretly love to leave the “normal” path through life, but they feel trapped. I can totally understand why they’d feel a bit envious of writers and others who get to do what they love all day, every day! Thanks for bringing the US point of view to the extrovert/introvert thing; when reading a few American bloggers (Trent Hamm from The Simple Dollar comes to mind), I’ve felt that introverts feel *obliged* to push themselves to socialise, because that’s what society seems to be telling them is “right”. Ali, I loved this post. It was a good reminder for me today because lately I’ve been feeling like a bit of an ugly duckling for not being “normal” and not having “normal” things like a full-time job, new car, etc. There are times when I want those things, but then I remind myself that the reason I want them is to fit in and to make life easier, not because I truly believe that they’d feed my soul or help me to reach my personal goals. I enjoy writing both fiction and non-fiction, but I can relate to Fiona’s observation that writing fiction can seem not world-changing enough. However, Ali’s point of providing readers with a few hours of escapism being a noble goal is a good one — for someone who is ill, in pain, hungry, or in a tough situation, a few hours of escapism may be just what they need. Also, I think that fiction can be entirely world-changing, in its own way, either by cleverly disguising a strong philosophical statement in the form of a novel (i.e., Animal Farm, A Wrinkle in Time) or by creating a strong hero/ine who inspires readers to change their own little corner of the world (Kathryn Stockett’s The Help comes to mind here). You’re quite right that fiction can be world-changing; I’ve certainly read novels that have affected me far more than any non-fiction could. But I think that even light, escapist fiction is worthy of a writer’s (and reader’s) time and attention. For writers — and freelancers in general — I truly believe that being an introvert is generally an advantage! As a teen author, I often feel as if I am insignificant compared to other other, more experienced writers. Posts like this really help remind me that, no matter my age, I am still a writer, and still carry the characteristics of one. Whenever I doubt my abilities, it’s post like these that really bring me back up again. Thanks; we writers appreciate the sense of community these posts instill. Thanks Joe! And good on you for getting started young. I wrote throughout my teens, and I’m very glad that I did; it was a valuable outlet, but I also learnt a huge amount about creating characters, structuring a novel, and so on. Thanks for another wonderful post, Ali. Unlike most of the other commenters, I’m an extrovert (who loves to write). I think I have an interesting combination of introversion and extroversion, which hopefully will give my writing a unique flavour. I can relate to the vast majority of what you’d said and agree it’s important that we writers go against the grain and allow our uniqueness to shine through. I have always considered myself a writer. Not a great one, not a published one, not even one who makes a single coin for my efforts. But a writer non the less. I am always best expressed in the written word. I can get my point across this way. Speaking, I stumble and often fail to communicate what my mind has already written as my script. I am introverted and defintiely not normal. My husband always makes me feel loved for that fact but sometimes his face also tells me he wonders where some of my thinking comes from. After achieving the ‘norm’ of a great job, 6 figure income, the car, the house and the posessions I am embracing my ‘abnormal’ desires and embarking on a career that makes my heart sing. The opinions of others at this move are just what I expected and at times that stalls my determination. Like you, I tend to stumble when I’m speaking — I often worry that people who know me through my writing will expect me to be more eloquent! I hope you can stay determined. It’s really tough when other people have strong opinions on what you should/shouldn’t do — I’ve been lucky enough to have a lot of support from my family and my husband, but I know they must still think I’m a little crazy at times! I lived a “normal” life for many, many years. I felt like I was living a lie, much as homosexuals and transgenders describe living like a “normal” person when deep inside they are someone completely different. I don’t know it’s the same thing as confronting a sexual identity that is not what’s portrayed on the outside, but I get the sense it is, in that it took me a very long time and much struggle to come to grips with my “real” identity as a writer, a creative, someone who is completely different than every other person I know. And then there was telling my family and friends: coming out of the closet so to speak. As for introvert vs. extrovert (I’m an introvert, by the way), I live in the US and I don’t know what the stats are, but it’s my impression that being an extrovert is definitely the way to be. It means you make and have more friends, more fun, and a more interesting life. That’s my impression anyway. Kaleba’s last blog post ..The Gauntlet Was Thrown – And I Stepped Up to the Plate! I think to key to being a writer is to be yourself. I’ve found that a lot of people who try to emulate writers think they need to be “larger in life.” They have to tell the world their ideas, they have to be constantly creative, they must be loud, they must be heard. While that might ring true with some writers, I found it opposite to how I view writing. Writing is personal and quiet. It speaks softly and touches where it needs to. I used to think I needed to be louder to be a writer, and thankfully, I no longer believe that. Instead, I am myself, and my writing has strengthened because of it. I think that’s a really crucial point, Deborah — thanks for adding it. For some writers, being a little “larger than life” is comfortable and fitting; for others, it’s not. Struggling to write and behave as someone you’re not is only going to harm your writing (and your happiness) — as you point out. I lost my family when I had the guts to say I no longer cared if it were wrong, my defeat began at six, so I feel justified that 33 years have been way beyond my duty served. I am so grateful for this post, a pride even, at a silly blog name, putting me in a family all of its own. “Normal is a Setting on The Dryer” is sending you a shout out, an eccentric crazy one, as loud and out of tune with costume and no rhythm, for I am finally out of “normal” Rehab, a place I wish all could see it was an illness that never did exist. Katie, thanks for such a heartfelt comment. It’s great that you’ve been able to find your voice and live your own life, despite facing rejection and criticism. Keep writing! I’m somewhat new to your blog, but I’d like to say that I’m glad I came across it. You’re posts are insightful and I really enjoy your writing style. I especially liked this particular post, so much so that I thought I’d jump into the commenting. Most days I’m quite extroverted. I enjoy socializing with friends, family and the like, and because I work in retail, human interaction is something I rarely can avoid. However, I have days I feel extremely introverted. I call these my down days or days to decompress. I enjoy little more than a good book, some creative writing or reading an interesting and thought-provoking blog post (like this one). I know it isn’t depression, anxiety or anything of that nature. It’s just a day I need to calm my brain and keep it away from outside distractions. The only troubling side to this is when something (or someone) disrupts my day of decompression. I find it challenging to interact and I’m often at a loss for words. I live in the US, the New England area to be more precise, and I come across many people who have similar personalities. I always say I’m two parts extroverted and one part introverted. Some days I can socialize with the best of them and other days, no matter how much I’d like to, I just can’t. Sometimes I find my personality to be very situational, and how it’s going to behave will depend on several variables i.e. meeting new people, being with friends or family, type of weather, my energy level etc. I like “two parts extroverted and one part introverted” — and really, I think all of us are somewhere on a spectrum of extreme introvert — extreme extrovert. I hope you do get to switch from your job to something that’s more “you”! I really value being able to work on my own, from home — though there are times when I miss having colleagues and company during the work day! I’m an American who grew up in Germany — so, no matter which of the two countries I happen to be in, somebody will eventually label me as “not normal.” I’ve learned not only to be okay with this, but to rejoice in it. I’m most definitely not an extravert…but my “abnormality” guarantees that no matter where I go, my introvert self will stand out from the crowd. I’ve definitely found it easier to be a full-time writer in America than in Germany. But I think that’s mainly due to the fact that the cost of living is lower in America (specifically in Oklahoma), which means that the husband and I can afford for me to stay home and write while he supports us. We’re American citizens, so finding a job that would pay enough in Germany would be next to impossible. I am an intoverted person, shy around people I just met. I just open up to few people and therefore I was often deemed abnormal by others. The question as to whether I would want to be normal or not… I don’t really always know. I’ve thought about it once or twice and I guess in the end I don’t really want to be like everybody else, but often I do wish I was more normal=average because it would make life a lot easier. I couldn’t imagine not writing and reading as much as I do. When people tell me I’m “weird” or when they just judge me, I always think that I’d much rather be me and write than be them and *not* write. Partially because I couldn’t imagine it, but also because I think that being “abnormal” makes you strong in some ways. You think for yourself and don’t base decisions on other people’s opinions, because that is often part of being normal. Thanks Kathy! I sometimes think that being “normal” would make life easier (a regular paycheck often sounds nice ;-)) … but I figure, overall, I’d rather have a harder and more exciting and fulfilling life. I absolutely agree that it’s not worth basing decisions on other people’s opinions: everyone will have different biases and preconceptions, so it’s impossible to please everyone anyway — far better to live your own life! My impression of teaching is that it takes up a *lot* of time and energy (several of my relatives are or were teachers) — though perhaps you could teach part time or do one-to-one tutoring? Security is important to me too, so I saved up an emergency fund in the bank before I started freelancing — it is possible to be a writer and to be financially secure. 🙂 Though I’ll agree it’s not the right path for everyone! Teachers don’t have as much free time as you might think. Yes the schedule appears nice, good hours and all holidays and summers off. But most evenings are filled with correcting other people’s work and the required courses to keep your job take up much of the summer. Teaching is a great occupation, but not for those faint of heart. Standing in front of a class everyday is not as easy as one might think. It is possible to blend teaching and other vocations together and I wish you luck! So if i ever did finish a novel and wanted to publish it, if the opportunity would arise, I could take half a year off how however much I see fit and still have a job when I get back. Maths and physics sound like great subjects to focus on, because they’re not so “wordy” and will hopefully leave you with some brainpower for writing! “You don’t need to be normal. You need to be you.” That’s something we could all use plastered up on the mirror we look into at the start of each day. I have been a writer since I was nine years old and I started my first short story. I have never quite known what to do with this desire to write. It comes out in all sorts of quirky ways; journaling, random but constant note taking, lists, goals, charts, a 50,000 word novel once, and now that I have finally taken the leap -blogging. But it’s always there. And no matter how far I turn to face normal it never goes away. I am always happier when I am writing. Or better yet, when I have written. I enjoyed this post. Not sure there is a normal. Everyone is different. I just like being me. I love to write and have sort of limited how much I get to do because of other obligations, but I’m changing that. If people enjoying writing is not normal, than I’m not. But maybe we are the normal ones and those that dislike writing are the ones who are not normal. Maybe we have learned a secret others have not yet acquired. I’m happy when I’m writing and that is all that matters to me. It doesn’t matter if others read it or not, (well it does, but that isn’t why I write,) it is the act of writing and putting my thoughts on paper that fulfills me. There must be a lot of us who aren’t quite normal if you look at how many people are blogging. Like you, I find the act of writing very fulfilling. But there’s also a part of me that feels my work isn’t *complete* until it has an audience of at least one person! Awesome post! I completely agree with all of this! For me though I find I’m more of a quiet extrovert (yeah, figure that one out, lol). I’m an extrovert but I observe people and life and I’m careful with what I say and oddly enough this has been taken for depression more times than none and I’ve been painfully thrown under the bus for it. I love reading posts like this that give me a sense of validation when no one else around me seems to. Luckily, however, I’m only talking about the majority of my “friends”. There are a few that seem to accept me, even though they may not completely understand. And my family is 100% supportive and enthusiastic about my writing. But sometimes I think I need to move, find some other writers just so I might be understood, lol – btw, I’m in the U.S. – Pennsylvania to be exact. Lauren, I’m so glad you’ve got some people who accept you just the way you are, and that you’ve got the support of your family. It sounds like you might want to form some links with other writers — is there a writers’ circle or workshop group that meets locally? I’ve always thought being normal was overrated. When I was in middle school my friends and I would say “thank you” when people called us weird. Maybe that made us weirder, maybe not, but we were happy with the title either way. I’ve been writing full time for 20 years. To me this is normal. But once in a while I realize that getting up, putting on sweat pants and t-shirt, going down stairs, brewing a cup of coffee while the computer starts, and then going to work, isn’t normal for most people. I remember David Morrell at Thrillerfest warned people not to quit their day jobs to be writers. It concerned me for a few seconds, until I realized that my day job was writing. And I wasn’t going to quit it. It’s become “normal” for me after just three years … though I spent not-quite-two years in the “real” world of employment. My mother said I was a sarcastic toddler and knew the beat I danced too was a rhythm only I could hear. I am a collector of ideas, notions, and the stories of others. Alone in my world, I begin to weave my collection into a fabric for my own entertainment, until the characters start talking in their own voice and we veer together onto another path of discovery. On second thought, don’t. I’m 13, and totally broke cuz I have trouble not spending stuff on books, souvenirs, all that. Totallly loved this post! Glad to say I am not normal at all (and extremely happy about that). Little bit concerned about that comment about people suffering memory loss (not to mention the other stuff) from spending too much time alone. I am really hoping that one is not accurate!! I wonder if talking to the cat a lot means you are not really alone? Ah see, I am even abnormal for writers, for I am an extrovert and I do have 2 of the ‘norms’ in the list lol. A friend of mine once said that I am the only person she has ever met that had her head in the clouds and her feet on the ground at the same time. I am both physical and ethereal, I like the maths and sciences as well as the arts, I am a pragmatist as well as a romantic, I see the glass half empty but getting fuller. I am ambidextrous albeit unevenly so. Some detractors of mine see that as an inability to make up my mind, but in fact decision making is something I am fairly good at. Ah well, maybe that is why I am as yet barely published HAHAHA! When I stop preferring the middle of the road mayhap things wilt come my way! Sounds like you’ve got a great mix of interests — and that’s a great thing for any writer. 🙂 And there are plenty of writer-extroverts too — including some of my friends! I love this post. Now i know I am not alone. I thought I am crazy because I (most of the time) think differently from other ‘normal’ stuff. I just quit from my good-salary-but-so-normal job as a book editor in publishing. I decided to do something I really love : writing a novel. Btw, is there any forum that i could join and discuss with other writer? You’re right in all aspects. Writers are introverted and Writers work for themselves. I worked as a copywriter for more than one year but I didn’t have to go to the office much. I think it’s a writer’s privilege to be free from the routine office work that locks her mind from writing something inspiring. But there is a thing. Writers tend to be introverted, but they should learn to be more extroverted. Joining the a dynamic world will give them more opportunities to observe, experience and write. Most of writers I’ve known so far are experienced active people. Thanks Hayley! 🙂 I agree that it’s good for writers to push themselves to get out a bit more … it’s so easy to default to staying at home, but there’s lots of inspiration (and fun) out there in the world! I feel only the writers who remain unpublished are considered abnormal by the society. You probably referred to creative writers in this post, right? I have seen people’s writings’ primarily driven by money. They have no name or accreditation to their ‘own’ writing…Like in freelance academic writing, news writing, and technical writing, people would fairly call a writer as ‘abnormal’ in psychotic context. Do you agree? faisal arshad’s last blog post ..Man? Middle-Class? Marriage? Wait till you’re 30! Thanks Faisal. I’m thinking of creative writers here, but also bloggers and copywriters, to an extent. I guess you’re talking about people who’s writing isn’t credited to them? (e.g. ghost writers, some website writers). I don’t think that makes too much difference to the act of writing, though it may make it harder to self-identify as a “writer”.